Cardiff’s Craig ‘The Kid’ Kennedy (11-0, 6KO) came of age with a savage seventh round knockout of London’s Wadi ‘Machoman’ Camacho (12-5, 8KO). The cruiserweight contest was the main attraction of Sanigar Events’ ‘Unfinished Business’ show at the Newport Centre and they delivered a back-and-forth barnstormer. 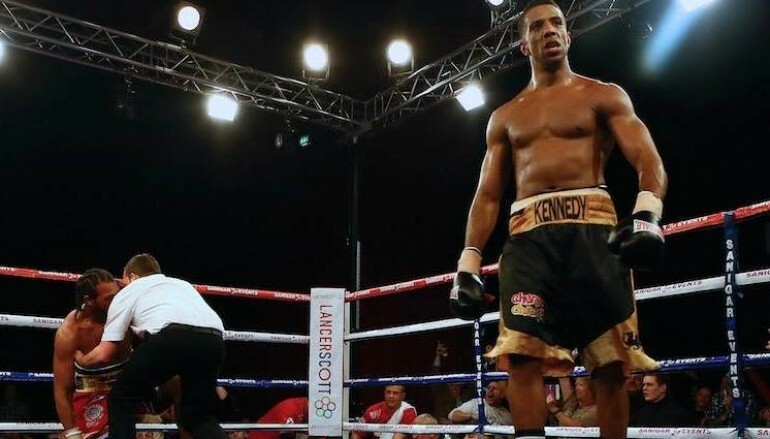 Five months after their first meeting, when Camacho was controversially disqualified in the second round for an alleged bite, Kennedy provided a conclusive answer to the ‘what would have happened?’ questions. In the referee’s final instructions, Kennedy was told, “it’s not a street fight” by Reece Carter when he refused to touch gloves but it quickly commended in to a slugfest. Both boxers began at range, standing off each other so they had room to step in with power punches. In the early exchanges Kennedy, circling to the his left – the side of Camacho’s southpaw back hand, drew first blood as he remained patient and goaded Camacho to throw first, and miss, only to be countered with straight rights. The Londoner would quickly recover and push Kennedy back to the edges of the ring apron where he threw three punch combinations, before falling in and smothering Kennedy before the Welshman could reply. After the opening two rounds went the Welshman’s way, Camacho came out for the third round looking to make a statement. The former Prizefighter tournament winner and English title challenger put all of his weight on the front foot, eager to create forward momentum. However, once the fists were flying, both were vulnerable as they exchanged at the same time and both had their chins checked. Camacho, usually a crafty counter-punching southpaw, was blatant and basic in his approach. Maybe the 29-year-old was attempting to utilise his 4lbs weight advantage but Kennedy was often wise to it. The first big breakthrough came at the end of the third as Kennedy turned Camacho and launched a fearsome two-fisted attack. There were plenty of reminders for Kennedy through, the Steve Robinson trained boxer was often caught with his chin in the air and will be critical of parts of his game when he watches it back. One moment for scorn will be the start of the fourth when Camacho found the crude backhand he was looking for. Luckily for Kennedy, it had little effect and he soon regained his composure. Later in that round, their toe-to-toe action was interrupted when Camacho received a warning for use of the elbow, before being hurt and almost staggering through the ropes. Between exchanges, the action was occasionally messy up close, the only scoring shots at short range were often rabbit punches. This was mainly down to Kennedy’s tactics to drain Camacho of energy and he was perhaps cautious to avoid another controversial biting incident. At times, Kennedy was on the edge of a formal warning for holding as he shut down Camacho’s inside work by tying up his arms from the elbow. By round five, Camacho’s nose was bloodied and right eye cut, Kennedy was by far the happier fighter but there was plenty more to be done. It was being done though, as the Welshman picked his moments to spring off the back foot to catch Camacho as he overreached. In round six, both were visibly tiring and feeling the pace of a frantically paced five rounds. Kennedy, who at one point slipped on advertising toblerones, was smart and began to conserve energy, pot-shotting and ambushing Camacho when he recklessly rushed in. After numerous give-and-take exchanges, it began to tell and it was Camacho who was cracking first. Despite immense bravery, Camacho was almost stopped at the close of the sixth and in the seventh, Kennedy picked up where he left off. After walking himself to a corner and dropping an exhausted Camacho for the first time with a counter left hook, Kennedy kept his opponent on the backfoot for a considerable amount of time, arguably for the first time in the fight, and made it count. A follow up attack sank a brave but bloodied Camacho to the canvas for a second time, a Kennedy left landing just as the referee waved it off and it was over. Finished business. At the time of the stoppage, the scoring referee had judged Kennedy had done enough to take all six of the previous rounds. The Trowbridge, East Cardiff, resident now moves in to the top 10 domestic rankings and is aiming for a British title shot in three fight’s time. Image by Huw Fairclough – click here for more.